Obituary – Dunn, Allen Elzie « Perry High School Alumni Association, Inc.
﻿Allen E. Dunn Sr., 50, was found dead at 7:45 a.m. Friday, Dec. 18, 1998, at his home at 14 Wilshire. Funeral will be at 10 a.m. Tuesday, Dec. 22, 1998, at Brown-Sisson Funeral Home chapel. Rev. Kevin Devlin will officiate. Burial will be at the Sacred Heart Catholic Cemetery at Billings, under the direction of Brown-Sisson Funeral Home. Memorial contributions may be made to the Oklahoma Medical Research Foundation cancer fund or the Boy Scouts of America. Dunn was born April 8, 1948, in Enid, the Son of Elzie and Agnes Josephine (Hines) Dunn. 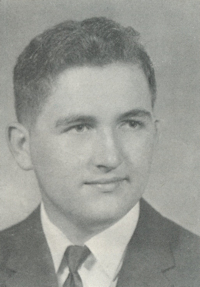 He attended St. Joseph Academy and Perry High School. Dunn served in the United States Marine Corp as a recruit depot instructor in San Diego, CA, and was a Vietnam veteran. His special awards and medals include the Presidential Unit Citation, combat action ribbon, good conduct medal, national defense service medal, and Vietnam service medal and campaign medal. He was married Oct. 25, 1969, to the former Edit Branson, at El Toro Marine Base in Southern California. Dunn worked as a heavy machine chain assembly employee at Charles Machine Works, Inc. He was a member of the Veterans of Foreign Wars, and a volunteer for Meals On Wheels and Boy Scounts. Survivors include his wife, Edit, of the home; two sons and daughters-in-law, Allen Jr. and Janelle Dunn, Perry; Jeff and Malinda Dunn, Perry; his mother, Agnes Dunn, Perry; a sister and brother-in-law, Beverly and Leroy McAdams, Chickasha; two grandsons, Michael and Travis Dunn, Perry; and one granddaughter, Peyton Dunn, Perry; two nieces, one nephew, one great-niece and one great-nephew. He was preceded in death by his grandparents and father.